offering students a mix of cardio, resistance training, dance and burlesque. But pole dancing hasn’t always been Fustier’s “true love.” Growing up in Ontario, Fustier got her grounding in athletics and choreography, taking synchronized swimming, gymnastics and figure skating with her twin sister, Cynthia. “When we were growing up my sister was the athletic one,” Fustier says with a laugh as she explains that the tables have turned now that her sister teaches English in Montreal and Fustier travels there for pole dancing instruction at Alternative Fitness. Fustier moved to Cumberland 15 years ago and discovered mountain biking. She caught on quickly and it wasn’t long before she started the Dirty Skirts group ride for women and began touring the BC race circuit. The benefits of her mountain bike racing years carry through to her new profession though. She has the cardio and strength to perform the demanding pole dancing routines. Sitting across from Fustier in her Lululemon capris and a bikini top, it is hard to imagine her slender arms covered in mud and scratches ripping cross country on her mountain bike. It is possible, however, to see how pole dancing tones the entire body while strengthening and lengthening every muscle. Following her mountain biking adventures, Fustier opened Tarbells Café in Cumberland. After five years at the coffee shop she discovered pole dancing and knew right away that that was what she wanted to do. So she sold the shop and, with the help of her friends, renovated the space in the College and opened the doors. She first came across pole dancing a year and a half ago at a friend’s stagette, where a woman from Campbell River had been hired to teach the party-goers how to pole dance. “She brought her pole to the house, showed us how to do some moves and from there I got hooked on it. I bought my own pole, took it home, and started getting videos to teach myself.” Her next step was pole dancing instructor certification at Pole Dance Studios in Vancouver. To get a true feel for the classes, I have signed up for Femme Natale’s 6-week program for beginners. Instructor Nadyne Moldowan makes the moves look easy through a simple approach: “dedication and passion.” She came to one of Fustier’s classes to “check it out” and hasn’t missed one since. In less than a year, she has become an accomplished dancer and instructor. Moldowan laughs as she steps up to the pole and tells Fustier she is the perfect example of that. “You have no idea what you have unleashed,” she says. The tunes begin as Moldowan demonstrates what the beginner students will learn in their first 6 weeks. The routine, designed by Fustier, is called Cookie Jar and at first it is hard to believe that even rather awkward, timid people like me will be sassing out these moves by the end of the session. For me, by the end of the third class things are starting to click. As each move starts to feel more natural and the muscle aches from last week’s class translate into new strengths in this week’s class, I find that I am really starting to enjoy this beautiful workout. As I look around the room at the women in the class—who range in age from 18 to 60 and all fitness levels—I can see that I am not the only one. Farm. Food. Wine. These are the three elements that make up Tria (Latin for three)—a new partnership between Nature’s Way Farm, Blue Moon Estate Winery, and local chef Kathy Jerritt’s culinary studio. Tria is inspired by, and hopes to inspire in others, a love of the land, of delicious food hand-made with care and creativity, of the pleasures of sipping locally-made wine, and of the community-enhancing fun of sharing all these with friends and strangers alike. Although bounteous farms, great local food, and, increasingly, local wines are plentiful in the Comox Valley, Tria combines these in unique and inviting ways. “It’s much more than just sitting down and eating,” says Jerritt. Marla Limousin, proprietor of Nature’s Way Farm, the 21-year old organic farm in Dove Creek that provides a home for Tria, agrees. “You can tour the farm, pluck your own blueberries, pull your own garlic, get your hands dirty and have a sensory experience,” she says. For instance, Tria’s monthly full moon feasts are multi-faceted events. The evening begins with a leisurely tour of the farm, stopping frequently to enjoy al fresco appetizers and a pre-dinner drink. Guests can graze and sample as they wish. Dinner is served back at the elegant dining room or, depending on the weather, outside. Clients need to reserve ahead of time for this intimate dining event. The menu has been created just for this one night, based on what is fresh at the time. The wine is chosen carefully to pair with the food and to highlight BC wines. The atmosphere is less like a restaurant and more like a dinner party, hosted by the people who grew the ingredients, cooked the food and created the wine. During the evening you have a chance to get to know them, and to mingle with the other guests. At the end of the night, you take home a bottle of Blue Moon wine and a pint of blueberries, or other seasonal produce. There are many other food, farm and drink opportunities at Tria. At the simplest level, clients can drop by to purchase fresh blueberries, strawberries, salad mix, garlic and vegetables in season. Anyone wanting a special group dinner can call and set up a custom dining event, booking the dining room ahead of time and planning the meal, drinks and pricing with Jerritt. Custom dining is likely to appeal to families, groups of friends, clubs, teams and workplaces wanting a special way to celebrate. Guests have the dining room to themselves while enjoying full service. In the summer, outside dining is also available. As well, Tria will soon begin offering a series of cooking workshops in its kitchen. These will of course end in a meal, and the one and two day workshops will include time spent on the farm learning about harvesting, planting and composting. Another offering, called Travelling Tria, is their mobile crepe stand, which has been operating all summer at the Comox Valley Farmers’ Market on Wednesdays and Saturdays. Hot, made-to-order crepes are served with berry marmellata made from Nature’s Way organic berries and Blue Moon Winery’s berry dessert wine. There are plans to take Travelling Tria to festivals and other special events, and it’s also available for hire for parties. The berry marmellata is the first of what will be a series of value-added products. And of course, there is the Blue Moon Estate Winery, which is headed up by Limousin’s husband, George Ehrler. Blue Moon released its first season of wines on the day of the July full moon. All are fruit wines using local organic ingredients, either from Nature’s Way or other local sources. Although most people associate fruit wines exclusively with dessert wines, two of Blue Moon’s three varieties are billed as table wines, recommended to accompany meals. ‘Dusk’ blends three varieties of certified organic blueberries from Nature’s Way, intended to be served chilled as an accompaniment to game, duck, pork, and beef. ‘Soleil’ is a crisp and fresh table wine made from certified organic apples from Apple Lane Orchards on Denman Island. It too, is meant to be served chilled, to accompany white fish, shellfish, pork and chicken. ‘Eclipse’ is a port-style dessert wine made from Nature’s Way blueberries and Vancouver Island blackberries. It is fortified and finished in oak and pairs well with chocolate or dessert, or can be sipped on its own. There’s no doubt that Tria is bang on trend—think of the locavore movement, the slow food movement, agritourism, the burgeoning of local vineyards, the mainstreaming of organics, and even the ‘staycation’ trend of exploring one’s own backyard, brought on by the recession. But at the same time, Tria harks back to time-honored traditions and ancient customs. As well, she says, Tria renews our ancient and not-quite-lost connection to the cycles of nature. “The winery was called Blue Moon to recognize that without the moon, the tides, the weather and the seasons we wouldn’t have the farm products,” says Limousin. These days, people may be vaguely aware of these cycles ebbing and flowing, but the connection has lost its intimacy. Tria really brings that home by honoring the full moon or other key dates such as solstice or midsummer with a feast, she says. “These are markers that as a society we are lacking… unless you’re a Wiccan, but this needs to be available for the mainstream. People are wanting it,” she adds. 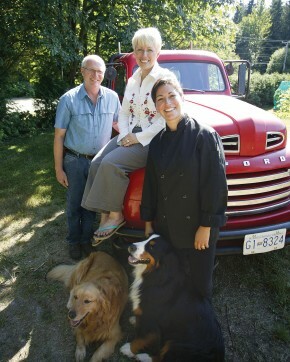 When I interview Limousin and Jerritt, the Comox Valley is roughly half-way through its ‘Eat Real. Eat Local 30-Day Food Challenge’, which celebrates local farms and food. My visit at Tria feels like part of that event and I am happy to be profiling local food producers. But when Jerritt says, “Let’s go tour the farm,” I agree only out of politeness, figuring it will not be of interest, because I live in a rural area and visit farms all the time—to buy eggs, produce or meat, or to visit friends. Oh, another farm, I think, somewhat jadedly. But my indifference quickly melts away. I fall immediately and blissfully in love with Nature’s Way. The sunlight filtering through the maples, the flowing design built into the customized shingle siding, the perfect balance between ‘tidy’ and ‘natural,’ the colorful clusters of flowers—especially the big bright sunflowers—accompanying the lush rows of vegetables and berries. I feel like I’m walking inside a glorious painting come alive with scents, sounds and the caress of a gentle breeze. Limousin’s interest in the potential of land to produce beauty is understandable: her background is in landscape architecture. She had no farming experience when she and her husband Goerge Ehrler bought Nature’s Way six years ago. “As a designer, I was into shrubs, annuals, perennials, flowering plants, just making everything look beautiful. I looked around this place and thought, ‘Oh, I’m going to turn that greenhouse into irises.’ But I decided to give it a season doing what the previous owner did.” The act of farming transformed her into a farmer—without taking away any of her aesthetic sensibilities.